This entry was posted in Management Pack, SCOM 1801, SCOM 2012 R2, SCOM 2016 and tagged #1801, #2012, #2012 R2, #2016, #Management Pack, #SCOM on March 14, 2018 by Warren Kahn. There are quite a few changes so as usual test in your labs where possible before deploying to live environments. Added two new object types (Windows Server 2016 Computer (Nano) and Windows Server 2016 Operation System (Nano)) and a new group type (Windows Server 2016 Computer Group (Nano)). This improvement will help users to differentiate the groups and object types and manage them more accurately. Added a new monitor: Windows Server 2016 Storport Miniport Driver Timed Out Monitor; the monitor alerts when the Storport miniport driver times out a request. Fixed bug with duplicating Nano Server Cluster Disk and Nano Server Cluster Shared Volumes health discoveries upon MP upgrade. See Troubleshooting and Known Issues section for details. Fixed bug with Windows Server 2016 Operating System BPA Monitor: it did not work. Fixed bug with incorrect discovery of Windows Server Operating System on Windows Server 2016 agentless cluster computers occurring upon management pack upgrade. See Troubleshooting and Known Issues section for details. Fixed bug: Free Space monitors did not work on Nano Server. Changed the logic of setting the override threshold values for Free Space (MB and %) monitors: a user can set the threshold values for Error state even within Warning state default thresholds. At that, the Error state will supersede the Warning state according to the set values. Fixed bug: Windows Server 2016 Computer discovery was causing repeated log events (EventID: 10000) due to improper discovery of non-2016 Windows Server computers. Fixed bug: [Nano Server] Cluster Seed Name discovery was causing repeated log events (EventID: 10000) due to improper discovery of non-Nano objects. 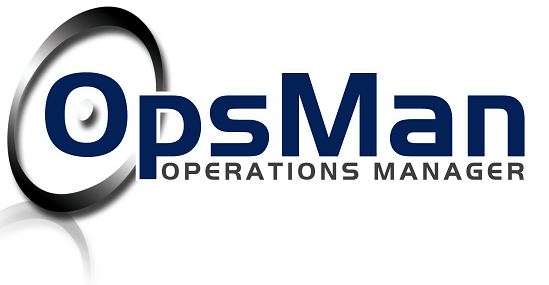 Due to incompatibility issues in monitoring logic, several Cluster Shared Volumes MP bugs remained in version 10.0.3.0. These are now fixed in the current version (see the complete list of bugs below). To provide compatibility with the previous MP versions, all monitoring logic (structure of classes’ discovery) was reverted to the one present in version 10.0.1.0. 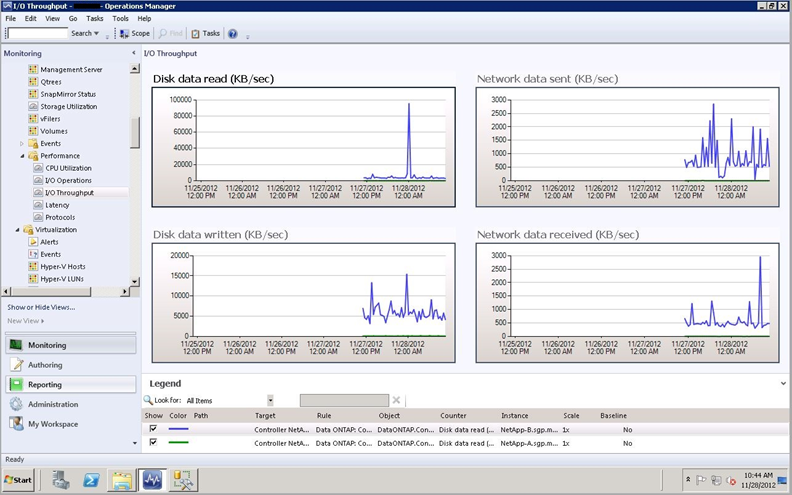 Fixed bug: disk free space monitoring issue on Quorum disks in failover clusters; the monitor was displayed as healthy, but actually it did not work and no performance data was collected. Fixed bug: logical disk discovery did not discover logical disk on non-clustered server with Failover Cluster Feature enabled. Fixed bug: Cluster Shared Volumes were being discovered twice – as a Cluster Shared Volume and as a logical disk; now they are discovered as Cluster Shared Volumes only. Fixed bug (partially): mount points were being discovered twice for cluster disks mounted to a folder – as a cluster disk and as a logical disk. See Troubleshooting and Known Issues section for details. Fixed bug: Cluster Shared Volume objects were being discovered incorrectly when they had more than one partition (applied to discovery and monitoring): only one partition was discovered, while the monitoring data was discovered for all partitions available. The key field is changed, and now partitions are discovered correctly; see Troubleshooting and Known Issues section for details. 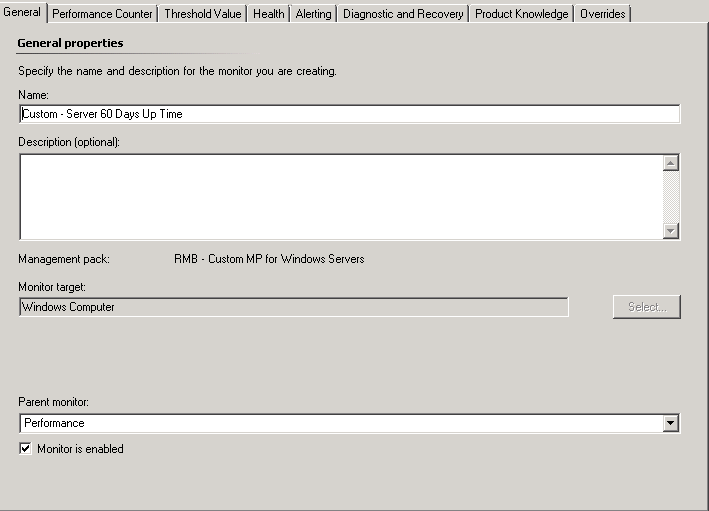 Fixed bug: Windows Server 2008 Max Concurrent API Monitor did not work on Windows Server 2008 platform. Now, it is supported on Windows Server platforms starting from Windows Server 2008 R2. Fixed bug: when network resource name was changed in Failover Cluster Management, the previously discovered virtual computer and its objects were displayed for a short time, while new virtual computer and its objects were already discovered. Fixed bug: performance counters for physical CPU (sockets) were collected incorrectly (for separate cores, but not for the physical CPU as a whole). Fixed bug: Windows Server 2016 Operating System BPA monitor was failing with “Command Not Found” exception. Also, see Troubleshooting and Known Issues section for details on the corresponding task. Fixed bug: View Best Practices Analyzer compliance task was failing with exception: “There has been a Best Practice Analyzer error for Model Id”. Fixed bug: in the Operations Console, “Volume Name” fields for logical disks, mount points, or Cluster Shared Volumes were empty in “Detail View”, while the corresponding data was entered correctly. Fixed bug: Logical Disk Fragmentation Level monitor was not working; it never changed its state from “Healthy”. Fixed bug: Logical Disk Defragmentation task was not working on Nano Server. Fixed bug: If network resource name contained more than 15 symbols, the last symbols of the name was cut off, which was resulting in cluster disks and Cluster Shared Volume discovery issues. Fixed bug: Logical Disk Free Space monitor did not change its state. Now it is fixed and considered as deprecated. The Management Pack was checked for compatibility with the latest versions of Windows Server 2016 and updated to support the latest version of Nano Server. Added new design for CPU monitoring: physical and logical CPUs are now monitored in different way. Updated Knowledge Base articles and display strings. Improved discovery of multiple (10+) physical disks. Added compatibility with Nano installation. This entry was posted in Management Pack, SCOM 2012, SCOM 2012 R2, SCOM 2016 and tagged #2012, #2012 R2, #2016, #Management Pack, #SCOM on December 1, 2016 by Warren Kahn. This entry was posted in Management Pack, SCOM 2012, SCOM 2012 R2, SCOM 2016 and tagged #2012, #2012 R2, #2016, #Management Pack, #SCOM on November 18, 2016 by Warren Kahn. If you ever need to alert if a server has been online for more then a specific time period, you can achieve this with the following method. In this example we will be alerting if the server is up for more than 60 days. 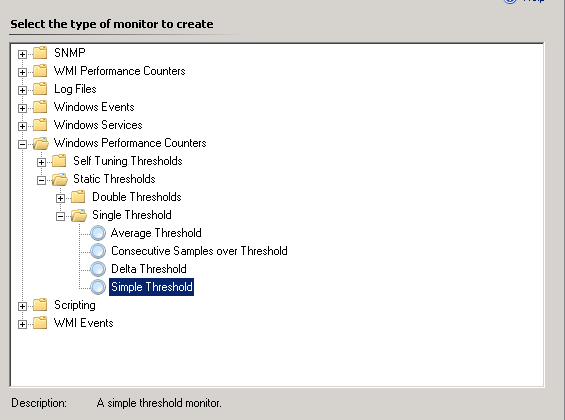 Firstly create a unit monitor > Windows Performance Counter < Single Threshold > Simple Threshold, targeting a relevant target, in this case we used Windows Computer. The threshold value is in seconds and needs to be set according to your requirement, in our case 60 days is 5184000 seconds. This entry was posted in SCOM 2012, SCOM 2012 R2 and tagged #2012, #2012 R2, #SCOM on August 30, 2016 by Warren Kahn. This posting is a follow on in my SCOM basics series. Lets start with what is Optimized Collection? 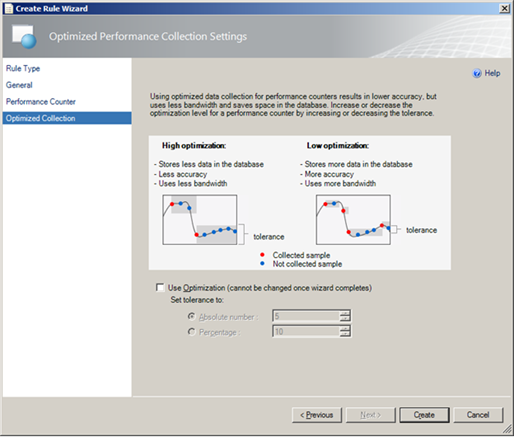 Optimization for a collection rule only collects a value if it differs from the previous sample by a specified tolerance. This is used to reduce network traffic and the amount of data stored in the Operations Manager database. Note: Optimization should be used for performance counters that are expected to only change gradually. For counters that are expected to vary significantly from one value to the next, optimized collection should be disabled. This entry was posted in SCOM 2012, SCOM 2012 R2, SCOM 2016, SCOM Basics and tagged #2012, #2012 R2, #2016, #Basics, #SCOM on June 27, 2016 by Warren Kahn.